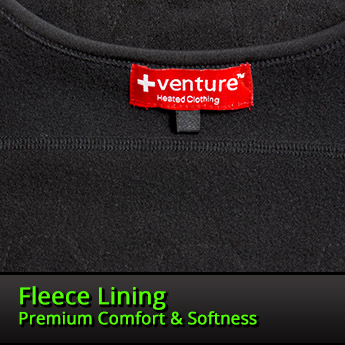 VentureHeat’s Heated Base Layer Top provides maximum thermal protection as well as moisture management to keep you warm and dry. Constructed with synthetic poly-spandex, moisture is wicked away from your body to improve dry time. When the temperature starts to dip, you can rely on this heated base layer to keep you warm. With just the touch of a button, you have access to 3 temperature settings and can enjoy the active heat for hours on end thanks to the long lasting lithium ion battery. 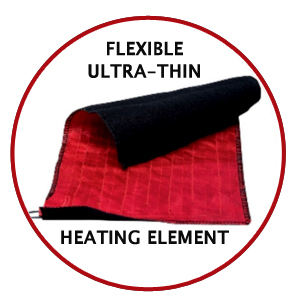 Our Xtreme Comfort Technology (XCT) heating system uses flexible hair-thin micro alloy fibers which are virtually undetectable until you turn on the heat and begin to feel the comforting warmth throughout your body. 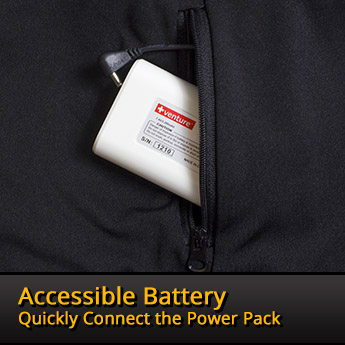 The base layer is equipped with three heating zones to keep your entire core warm. There is heating panel across the chest, one along the abdomen, and another larger heating panel across the length of the back to help promote blood circulation to your entire body. Powered by a rechargeable lithium-ion battery, you can rely on our heated gear to perform up to your demands for over 5 hours of heat per charge. With Xtreme Comfort Technology, we eliminated bulky insulation and coils which impede mobility, and replaced them with hair-thin, micro fibers allowing for a more flexible range of motion without the heavy layers. With sophisticated IC design and UL certification along with extensive product testing, our garment has gone through the most rigorous standards to ensure your complete safety. 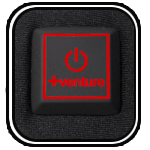 Enjoy the comforts of having heat when and where you need it most with just the push of a button. By wicking moisture away from your body, you don't have to worry about staying dry as the polyester-spandex blend dries much faster than conventional cotton fabrics which will keep your warm longer. 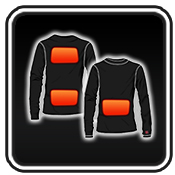 This baselayer is intended to fit snuggly against the body to maximize the amount of heat felt.